The Beauty of Life: My New Favorite Lipstick? Guerlain Le Rouge G.
My New Favorite Lipstick? Guerlain Le Rouge G.
Don't you hate it when you need to reapply your lipstick and you find you don't have a compact handy? Well, that's where Guerlain Le Rouge G de Guerlain Lipstick comes in. Not only is the lipstick within the tube one of the best I've come across in quite some time, but it comes with its very own mirror! The design of the gleaming silver tube is really quite intriguing. The futuristic design looks like a miniature rocket ship -- very space age-y yet still very upscale. Guerlain called upon one of the most talented jewelers from the Place Vendome in Paris, Lorenz Baumer to create it. Once opened, it clicks back to reveal a mirror that's the perfect size for reapplication on the subway, in the car, even discreetly at a meeting. And the lipstick? All I can say is wow. Designed with a precious ruby powder that interacts with the light to make it sparkle and glisten, it glides on smoothly and effortlessly. It's also supremely hydrating, making the need for lip balm underneath absolutely unnecessary. My favorite shade is Gentiane, a gorgeous pinkish coral that's perfect day to evening. Guerlain Le Rouge G retails for $49.50 at sephora.com. Guerlain is one of my favorite brand and it does not disappoint! This packaging is amazing, in both appearance and utility. 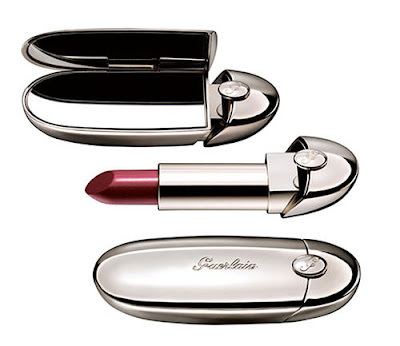 I like the lengths to which Guerlain went to design it, and the fact that it has a mirror. It is never okay to have lipstick on your teeth! As for its price.. I would have to consider it a beauty splurge that is well worth it. The lipstick is outstanding.. the texture and how it feels on your lips is luscious. Well worth the amount of $.. the packaging is superb! !